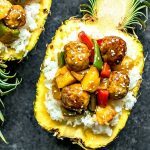 Pineapple Teriyaki Meatballs is an easy weeknight dinner made with fresh meatballs, sweet teriyaki sauce, and mixed peppers and pineapple, served over rice. Add olive oil to a skillet along with the onion, red bell pepper, and green bell pepper. Cook for 5-7 minutes until softened. While vegetables cook microwave the Cooked Perfect Korean Style BBQ Recipe Beef & Pork meatballs according to package instructions. Remove vegetables from heat and add the meatballs, pineapple chunks, pineapple juice, and teriyaki sauce. Toss together until well coated.